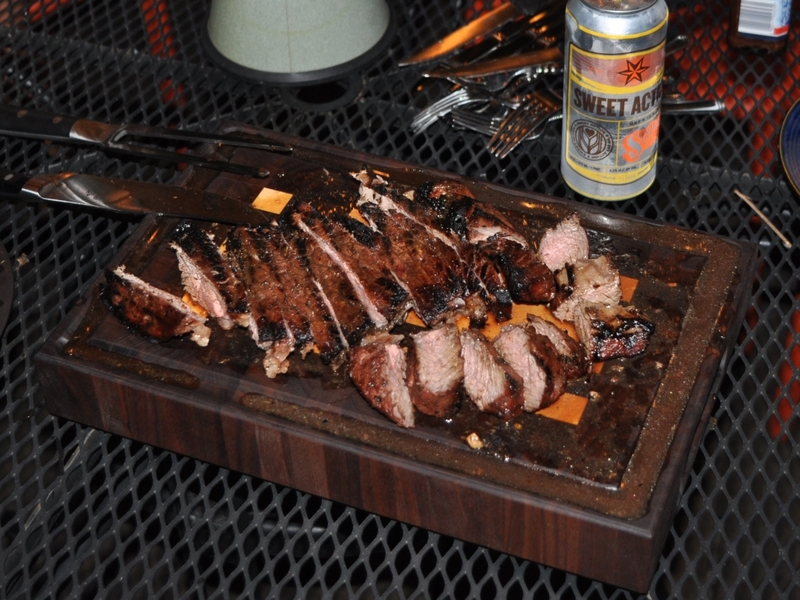 Every summer needs some London Broil. I made some last night to give the new carving board a test drive. Yum. 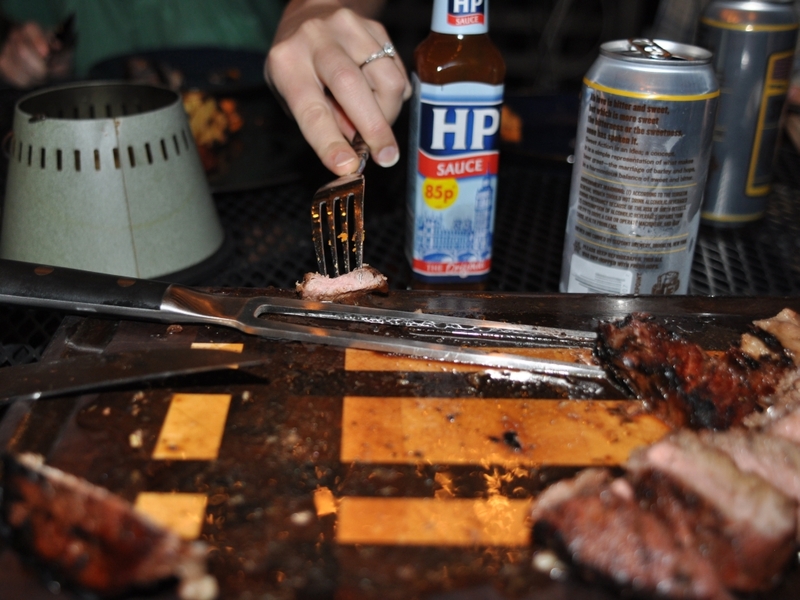 It worked quite well, and an evening with friends is even better with some tasty meats. 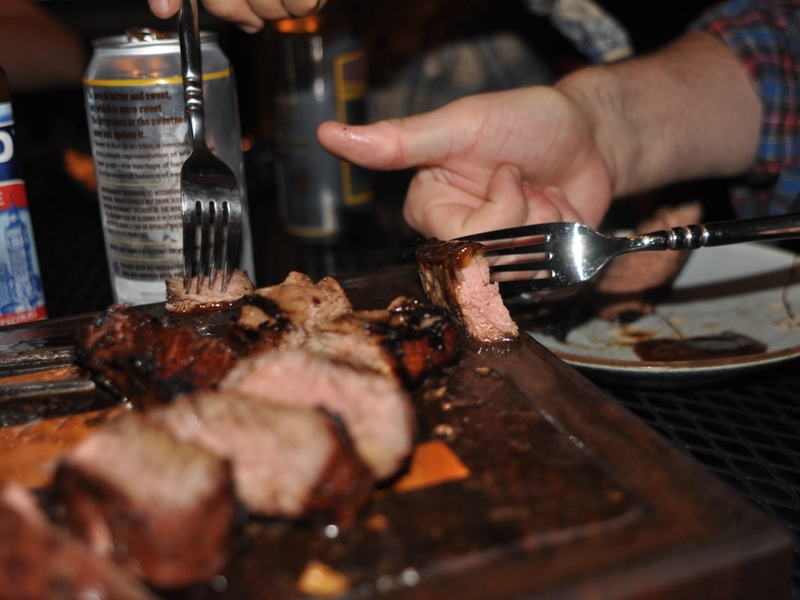 "London Broil" isn't a specific cut, and is generally top round or shoulder round. It's relatively inexpensive and usually can be a bit tough if you just throw it on the grill, but, with the right marinade, it's delicious. Go with a top round if available. The shoulder round cut that's sometimes labeled as "London Broil" can be a bit too tough. It tastes even better if you get it on sale! That's enough for one piece - which is usually about 2lbs. I find that's usually good for about 2-3 people. I like to put all the ingredients in a gallon-sized zip-top bag and mush it around to mix it well. Sure, you could get out your bowl and whisk and emulsify to your heart's content, but I have yet to taste the difference - and who wants to wash another bowl? There are beers to drink and a gazebo to sit in. If making more than one, make a separate bag for each to maximize marinade-to-meat contact. After you add the meat, squeeze out any air, fold over the top of the bag, and place the bag on a dish or tray (in case of leaks) in your fridge. Keep it in there for about 8 hours. Somewhere in the middle squish it around a bit and flip it over. On a good hot grill, about 8-9min per side should get you medium-rare. Let it then rest for 10min. 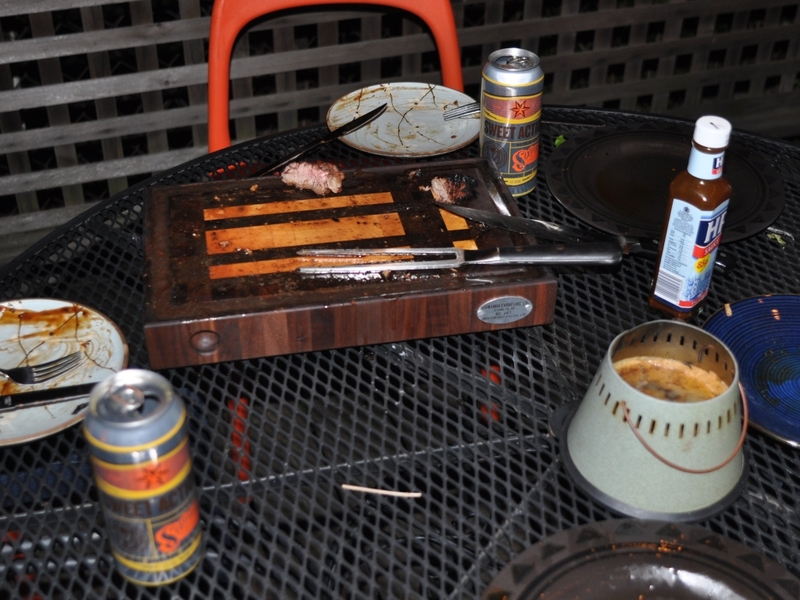 Last night's grill was a bit of an inferno, so we ended up with medium, but it was still quite tasty. I've just doubled my counter space with an over-sink cutting board, so I made some guacamole to take a test drive around the new acreage. 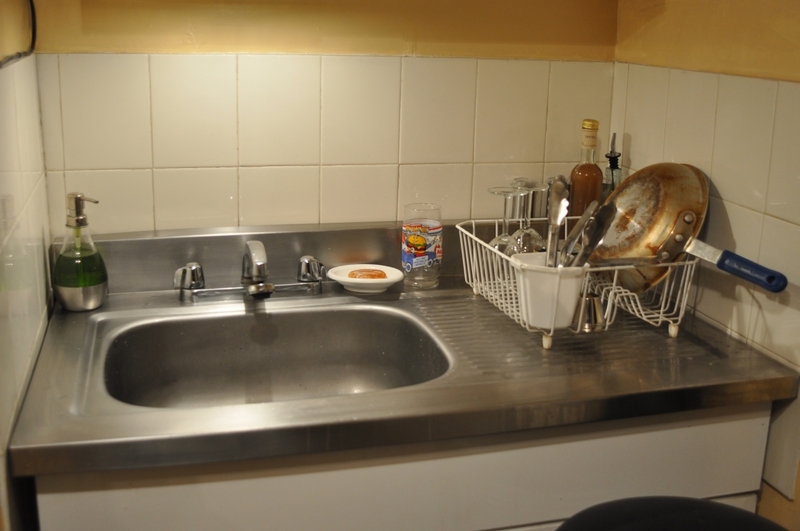 My kitchen has little counter space for food prep, but the sink pretty big. Note the recess on the right - perfect for holding peels and skins and seeds and such. Wow! 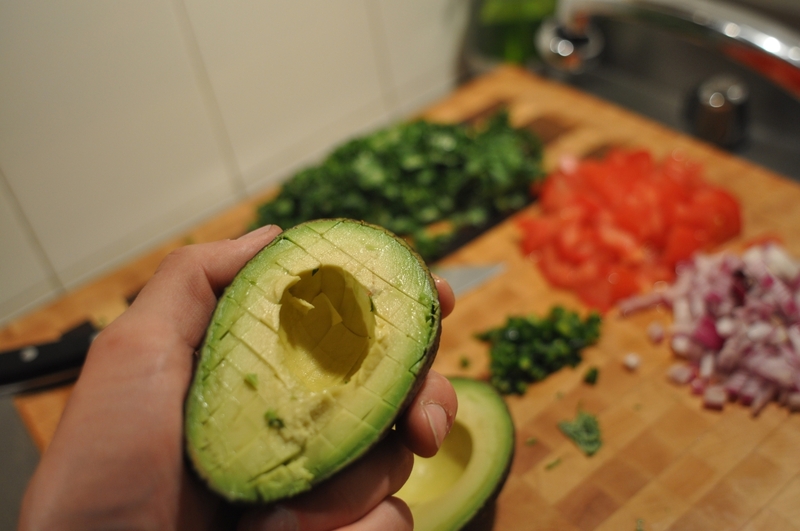 Hot tip I: slice your avocados in the skin - easier to get it out and all the dicing is nearly done. Acres of space. (Actually 0.00053 acres.) Skins and such are also neatly contained on the right. Hot tip II: Heat your limes in the microwave for 15sec to make them easier to juice. 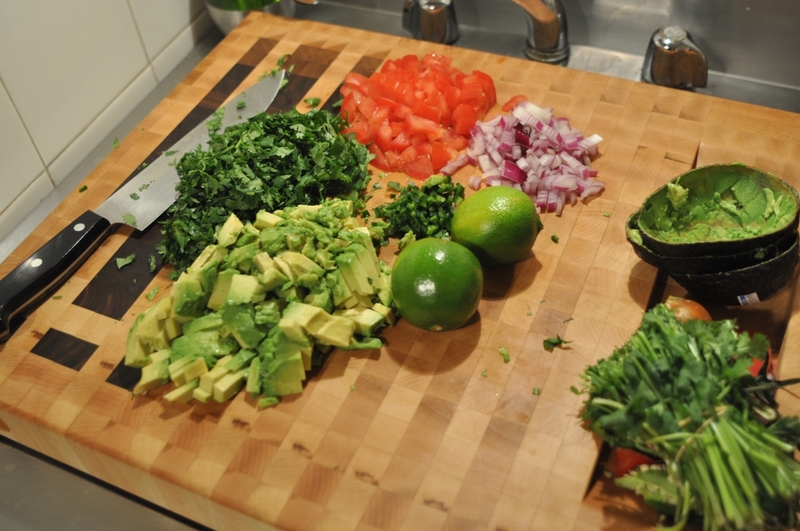 Interested in your own over-sink cutting board? Shoot me an email at info@gowanusfurniture.com.